Did you know that 1.59 billion people use Facebook every day? Not to mention, 700 million people use Facebook Events each month. But with more than 47 million public Facebook events created last year alone, how can you make your event stand out? To find out, we turned to Virginia Maloney, the Business Product Marketing Manager at Facebook Events, for her tips on promoting events through Facebook. Watch the full webinar recording of ‘How to Use Facebook to Sell Out Your Event’ here, or keep reading for some top tips. 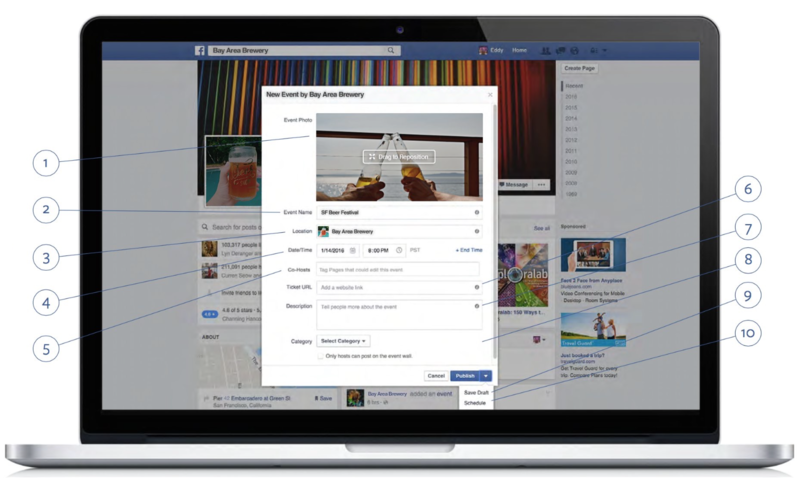 Your event cover photo will appear in different formats across Facebook, on both mobile and desktop. A 16:9 ratio will look good at any size, without causing your photo to appear cut off or incomplete. It’s also important to choose an image with little or no text so it’s easy to understand at a glance. If you choose to set up ads using your event photo, ads with more than 20% text won’t be approved, so it’s good to think ahead now. You want people to understand what your event is about — but long names often get cut off on mobile experiences. Don’t duplicate information about the location or time in the event name — those details will be included in your event posting. Events with long names usually receive fewer responses. Names written in all capital letters or with lots of glyphs are often hard to read and feel less legitimate, which can also lead to lower engagement. Selecting an accurate location, date and time, category, and tags allows Facebook to recommend your event to people who live nearby and have similar interests. Using a location that corresponds with a Facebook page or Facebook-suggested location improves these recommendations. Keep in mind that you can’t create an event that’s longer than two weeks. If you’re organizing a recurring event, we recommend creating separate Facebook events that each have their own time and place for more discovery opportunities. One way to do this is by using hashtags and mentions in the event description to generate buzz. This enables people to participate in the conversation, or find out more by clicking on the pages of any performers or partners. You also want to be sure your event description is well-formatted and easy to understand with the important details up front. Tell people why they should go, the line-up or schedule, any age requirements, when tickets go on sale, how to find the venue, and any other FAQs. If you partner with Eventbrite (and your event qualifies), you can automatically import all of your event data to Facebook — including your ticketing link. Using Eventbrite’s integration with Facebook makes your event an Official Event, which helps your chances of qualifying for better Facebook search and News Feed recommendations. The integration enables people to discover and purchase tickets for your Eventbrite event without ever leaving the Facebook app, which has been found to result in 2x increase in actual ticket sales. Facebook also found that events that sell tickets directly on Facebook have, on average, twice the number of viewers on Facebook as those without native tickets. The integration takes as little as 8-10min to set up. Check out this step-by-step guide to set this up through your Eventbrite account. And to learn more about using Facebook to promote your event, check out the new ebook: Facebook and Instagram Reveal How Users Discover Events.